Have you ever heard of the essay "I, Pencil" by Leonard E. Read? Written in 1958, it describes the surprisingly complex process of making a pencil. All the while, it illustrates the invisible hand and presents and interesting argument for free market economies. I like to have my students read the essay and then process what they’ve learned through creating a poster. 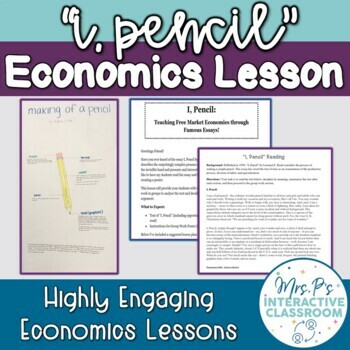 This lesson will provide your students with the text of “I, Pencil” and them have them work in groups to analyze the text and decide whether they agree with the author’s argument. Economic Systems & the Zombie Apocalypse Economy! For freebies, teaching tips, and more, check out my blog and sign up for my weekly newsletter! When you sign up, your first email will come with FREE supply and demand warm ups!